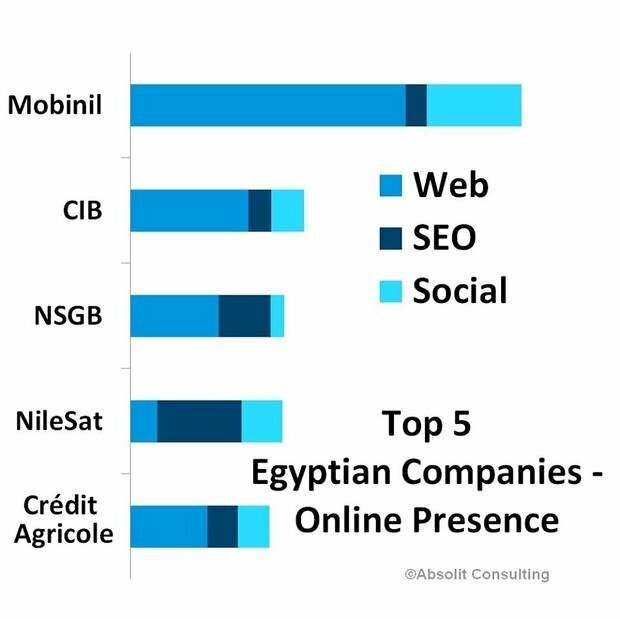 The top five companies in the list of overall online presence are: Mobinil, Commercial International Bank (CIB), National Société Générale Bank (NSGB), Egyptian Satellites (NileSat) and Orascom Development Holding (ODH). They were evaluated according to Web (reputation of website and traffic), Search Engine Optimization – SEO (visibility in search engines), and Social (presence in social networks). Mobinil ranked first in the Web and Social Web categories, whereas NileSat ranked best in the Search Engine category. Egypt has a severe problem with SEO. Keywords and Search Engine Optimization make up a huge part of a company’s online presence – however, many websites of the country’s top companies do not really work, have bad backlinks, or too little keywords. They also do not make attempts to collect email addresses of their customers or visitors, in order to be able to contact them later on. NileSat and ODH lead the list of companies that are most visible in search engines, and Mobinil and CIB have the best website reputation and traffic. Using Social Media for online presence and marketing is essential, since it is a very talkative sphere and companies should use that to meet potential customers and attract new customers. However, 40% of the top 50 companies do not have a Facebook-page, and 68% do not have a Twitter-account. For instance, Twitter can be a great tool for customer-support, but Egyptian companies – with the exception of a few – have not yet realized that potential. The report shows that even existing company accounts mostly have an inactive fan-base, which shows that not enough time, money or effort is invested in online engagement with followers. The study was prepared by Absolit Dr. Schwarz Consulting. The numbers in this study were extracted from various services and studies, as well as self-researched reports. To get the free sample version, visit www.egypttop50.com.